Burglars are marking houses as targets for break-ins with small, transparent stickers advertising a locksmith. The signs, which purport to offer a ‘24-hour service’ but include a fake phone number, are typically placed by letterboxes. Police in London have already linked one burglary to the stickers. They have received dozens of complaints from residents across the capital who have found them on their doors. Officers believe that ‘scouts’ place the stickers on properties they deem to be vulnerable, after checking whether the owners are at home during the day and if windows and doors are locked. It is thought the stickers were designed so that if a scout is apprehended while marking a house, they can claim they are simply handing out advertising material. A spokesman for Wandsworth Council in south-west London said: ‘These stickers are clearly not for advertising purposes. Inspector David Bannister from Wandsworth police added: ‘At this time of year with the darker evenings there is traditionally a rise in burglaries, particularly between 3pm and 7pm. ‘There have been a number of front doors found with stickers, giving details of a locksmith, which enquires reveal is not a genuine company. ‘It is assessed that these markers are being used by potential burglars to mark potential targets which are then returned to subsequently. 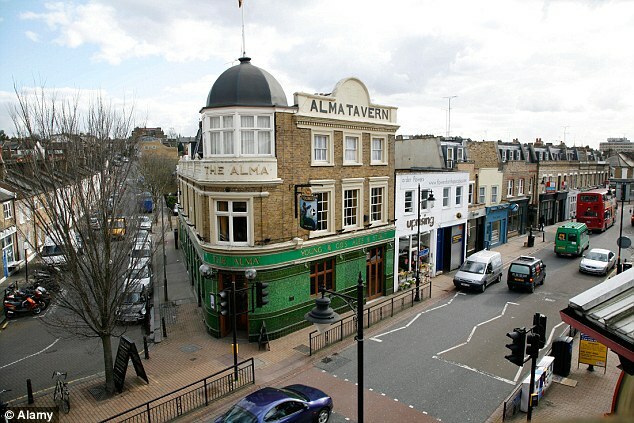 Cllr Jonathan Cook, the council’s crime prevention spokesman, said: ‘There is growing evidence that some organised teams of burglars may be using this method to target homes in South London. ‘We are therefore urging local residents to keep a very close eye out for these stickers and if they find one to remove it straight away. ‘There have been a number of front doors found with stickers, giving details of a locksmith, which enquires reveal is not a genuine company. These are placed near the main lock. The council later said that police had received ‘lots of new intelligence’ after a warning was issued to residents – and are now following up a number of new leads to catch those who are responsible. 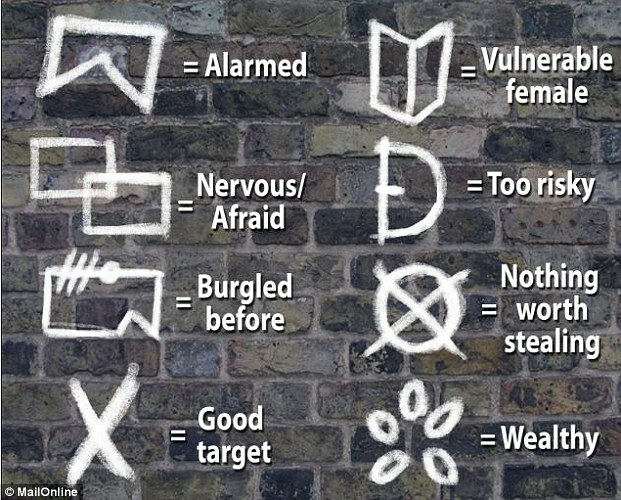 Burglars have been using coded chalk symbols to let other criminals know whether a property is worth targeting, MailOnline reported in September. Chillingly, one sign in Walkden, Greater Manchester, in the shape of an open book, said a vulnerable female resident is the occupant and another symbol indicated a ‘nervous’ homeowner.